I love the Happy Birthday thinlits die from Stampin' Up! and use it often on my cards. Its actually perfect for this week's challenge. Here's my card. The cardstock I've used is Fresh Fig and Basic Gray. I've used Silver Foil for the greeting and Petals Promenade papers on the background. A little glitter Washi tape and the Ribbon punch was used for the border . Here's a closeup of the greeting. This card was one from my display at my recent card class featuring the Petals Promenade papers. The ladies really enjoyed this class and the papers we used. They are gorgeous. I think the photograph taken outside in natural light shows the card off a little better than these one taken indoors with the flash, but thats life. We hope you will join in this week's challenge and can't wait to see what you create with your Large Greeting. 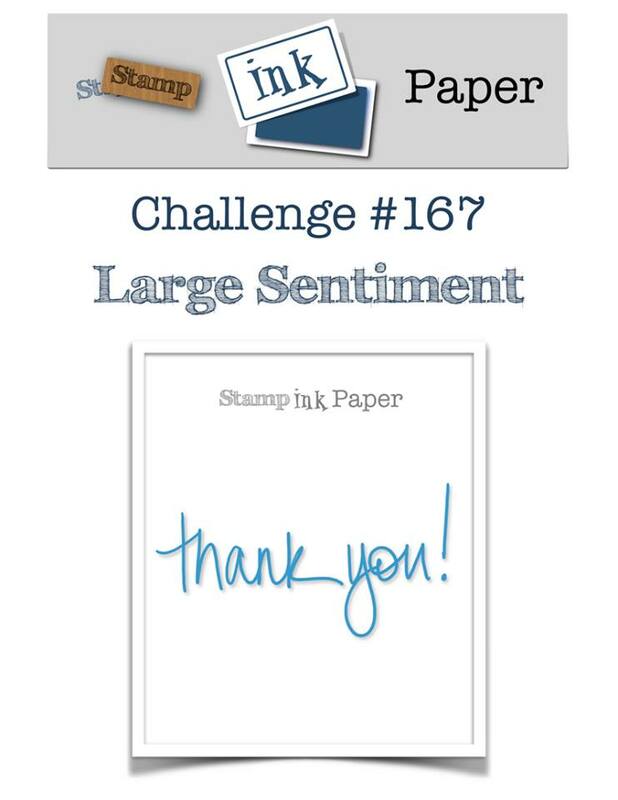 Also we have a giveaway for this challenge open to US residents, so please join us at Stamp Ink Paper. LOVE, LOVE, LOVE you card---could you tell me which color is the actual card base? Could you email me the directions to this card? Thanks very much Kate. The square base of the card is Fresh Fig. Basic Gray has been used as a border strip. You all know how I love my Easel Cards right? Well I've added a little light to them in the form of the little battery operated candles. Neil bought me some boxes of them online. I've been playing around with a couple of different designs which are for an upcoming class of very Special Christmas cards with my group but thought you might like to see them. This is the first one I've done using the retired stamp set Christmas Lodge. It's a gorgeous set with this beautiful tree and really suits a vintage style Christmas Card. I've also used the Deco Label Framelits which are fast becoming a favourite and the Beautifully Baroque and Fancy Fan Embossing Folders. The Cardstock is Cherry Cobbler, Early Espresso, Crumb Cake and Very Vanilla. I have the light on so you can see the gorgeous effect from the little candle. Here is a photo when it's off. 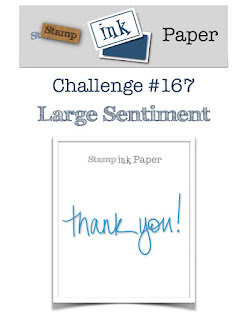 Welcome to our "Anything but a Card" challenge this week at Stamp, Ink, Paper. I made some tags for Christmas using the Scallop Topper punch and Santa's Sleigh framelits. They are rather cute, aren't they. The cardstock is Whisper White for the tags and greetings and the Deer have been cute from Copper foil, the wreath from Mossy Meadow and Red Glimmer for the bow. I used some Real Red grosgrain ribbon thru the tags and the greeting comes from Teeny Tiny sentiments stamp set. To on the front of the tag and from on the back of the tag (which I didn't photograph) stamped in Real Red ink is from the set Oh What Fun. I hope you will join in our challenge this week to create something other than a card. We look forward to you joining us at Stamp, Ink, Paper. These are for a customers order, but thought you may like to see them again anyway, as it is a card I've designed before, but because she would like 5, they are all going to be slightly different. I hate mass production, after all they are handmade cards and as such I like them to be individual, not copied, so there will be different colours, slightly different layout and arrangement of elements, but essentially and functionally the same. I really only do the mass production thing when I'm working on swaps, and I do get bored with making the same thing as well. This is the first one I completed today. Here's a couple more I've completed. and I finally got them all finished. I've made sure each once is slightly different and I'm really glad this job is finished and I can organise the post. I'll share with you some other cards that were also ordered next time.